The SEABOB is a luxury seatoy designed for “fun in the sun.” Corporate divers or technical divers are not invited to this party—unless they are vacationing, of course. No, this is a unit for scuba divers, free-divers or snorkelers, and meant to be purely recreational. I could not help but fall in love with the unit the first time I saw it. You will too. Just look at it! So sleek… such beautiful lines. I followed those lines with my hand and thought to myself: We are going to have so much fun! It took a few minutes to get used to it, but that was truly all it took. The steering and diving part came naturally, in no time. A bit of pressure, and I was diving. You will soon discover that you control the unit with your body’s movement. Relax, stretch those arms and allow yourself to be comfortable. You comfortable? Great. Now it is time to test its limits (and yours). The SEABOB comes in two models, the SEABOB F5, and the SEABOB F5S. I was, of course, handling the F5S—the fastest of the two. 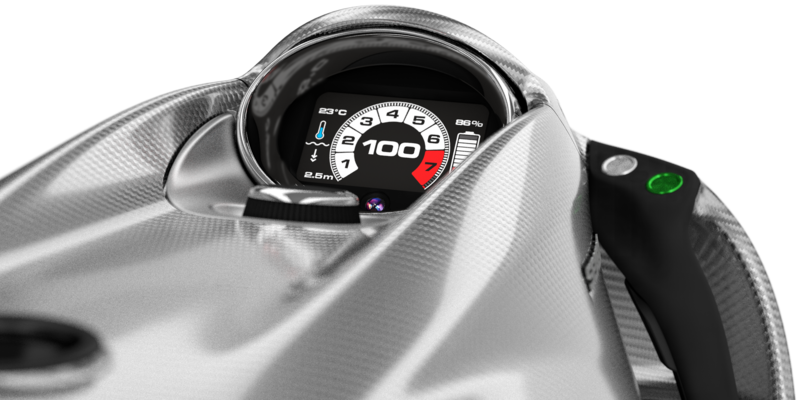 A light touch on the green control grip regulates the speed, and in no time, a driver can reach up to 18 km/h (11 mph) underwater. Believe me, that is fast, when you are pushing through water. I soon discovered that my body was not as sleekly designed to move through water as the SEABOB. My mask was pressing on my face and my regulator was vibrating in my mouth. But it was fun! I aimed for a wreck site where the event of the day was already taking place: a shark feeding. The visibility was amazing. I could see the wreck from afar, as I zoomed through the water. I felt like a superhero: the underwater Wonder Woman—that was me! I was coming in fast, perhaps a little too fast, and had to make a sharp right as I reached the aft of the wreck, to avoid interfering with the many sharks now circling around the feeder. If one finds oneself going too fast, or feeling out of control, all one has to do is to let go of the trigger, and the unit stops smoothly. Letting go never crossed my mind though—probably a stupid instinct left over from the car-racing days of my youth. But the SEABOB responded immediately to my body weight shifting right, and I glided with elegance (at least in my head) around the wreck, a safe distance from the action. I parked myself and my SEABOB at a point in the water column, facing the wreck, and took a moment to just observe. I was in awe. The sharks circled around the designated feeding station with such grace. Their motions were slow and controlled, yet it seemed like they could turn in a split second. They were totally ignoring the colorful school of scuba divers on scooters, who were zipping back and forth, over and around the wreck. I admit it. In my head, I had this idea to observe and then try to mimic the sharks’ movements. But after a few minutes taking notes and comparing my fellow divers’ appearances, side by side with these magnificent creatures, the conclusion was an obvious, “no.” No way. With every turn, every movement, we clearly demonstrated that we were merely clumsy visitors in the sharks’ world. Sure, evolution has given sharks more than a few hundred million years to reach perfection, but still, not even on a SEABOB could we compare with the sharks’ grace. Instead, I waved to my buddy, and we headed straight out, away from the wreck, over a vast sandy bottom. I pushed the scooter to its maximum speed, using all six power levels, until my face vibrated. I had a hard time holding on. I was having the time of my life—this thing was so fast! It was so easy to maneuver, and so silent in the water. I spotted a large stingray embedded in the sandy bottom, and decided to come to a halt and sneak up behind it. The plan was to hover above it, waiting for the moment when it took off, which almost inevitable happens when one gets close. Then I would follow it, from a safe distance away. Not this time, though. The way I slowly glided through the water towards the stingray, appeared to be non-threatening to it. I was totally ignored, until I eventually glided too far and shadowed the stingray. The ray took off, but only for a few meters, before it lay down again. I could take a hint, and aborted the stalking. 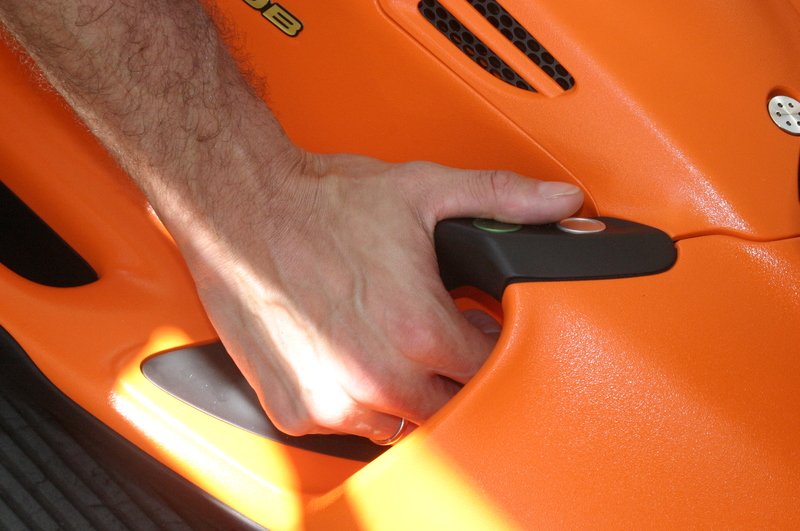 There is no chance of losing one’s bearing and propelling too deeply while driving the SEABOB. 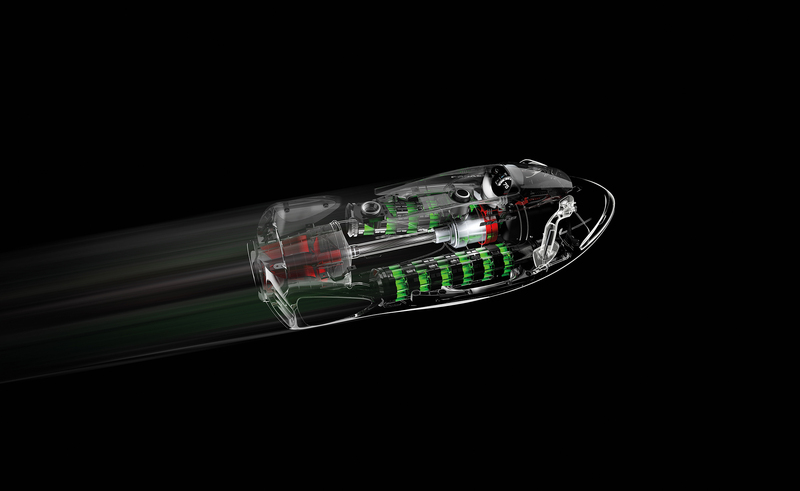 The SEABOB will never go beyond the sport diving limit of 40m. A safety cut-off feature will make sure this does not happen, and it is programmable to any depth above this limit. One does not have to worry about losing the SEABOB to the depths either, as it is buoyant and will return to the surface. The cockpit, or display, is easy to read, and right in front of the driver’s field of vision. As a diver, one wants to know one’s dive depth. This reading is also displayed, along with speed and battery life. Speaking of the battery, its run time is one hour, and one can quick-charge the battery in 1.5 hours. The SEABOB is light-weight. It is very easy to handle, especially for divers who juggle tanks on a regular basis. Depending on the model, the unit weighs 29-35kg at the surface, with 14-10kg buoyancy in the water. The unit can be outfitted with a built-in cam-system, with two integrated, easily-operated full HD-cameras—one pointing forward and one facing the driver. So, yes, you CAN take a selfie! A built-in storage system and a WLAN transmission module talks to an app, which you can download to your smartphone or tablet, so you can retrieve your footage quickly and easily after your dive. The SEABOB Power System moves the unit by employing the principle of water displacement. Water is sucked in by a rotating impeller, which is then forced out under high pressure, thus thrusting the unit forward. “Thrusting,” I know, sounds so harsh—like a race horse exploding out of its stall when the gate opens. 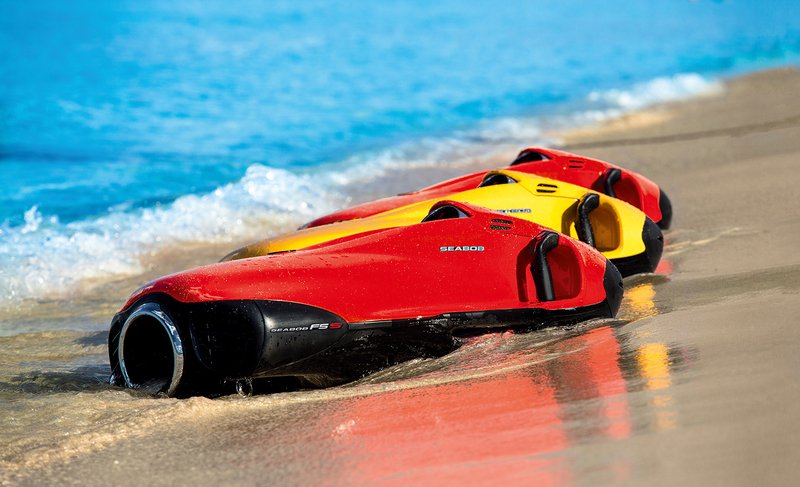 In practice, the SEABOB moves smoothly and silently in the water, right from the get-go. The manufacturer stated that the SEABOB is made with a sustainable, environmentally-friendly approach. The E-Jet power system, which is electrically powered, keeps the costs of operating the unit low. The material choices used in the SEABOB’s construction make the unit light-weight. The drive unit is made using premium carbon elements, with ceramic coatings and metals resistant to salt water. For more information, please visit: Seabob.com/en.